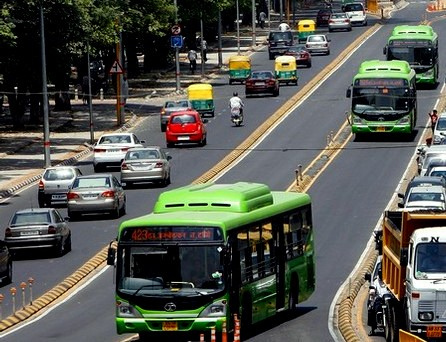 A new study shows that buses in designated lanes, like these in Delhi, can carry more people using less road space. Photo by jenspie3. Cars take up more space on Mumbai’s roads than buses and carry fewer passengers, says a recently released study. What’s more, a mere 10-20% increase in the number of buses along with designated bus lanes can make a serious dent in congestion and pollution. More than 65% of the space at the city’s arterial junctions is occupied by cars, which carry around 40% of the total number of passengers. In contrast, buses occupy just 8% of road space at the same junctions and carry 45% of the passengers. More buses in their own lanes would decrease the number of other vehicles on the roads. Graphic: Times of India. 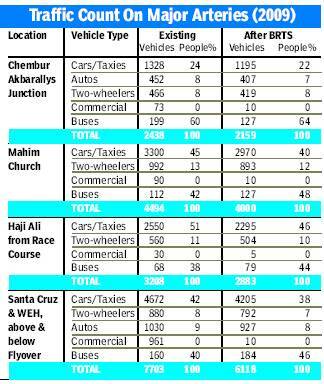 These statistics have provided sustainable transport advocates with even more evidence of the need for Bus Rapid Transit (BRT) in Mumbai. Transport experts took the findings to Dilip Patel, chairman of the BEST bus system, urging BEST to implement BRT as soon as possible. Patel agreed to push the issue forward, and is planning a meeting with political leadership.